Our Brand Spotlights are where we share the stories of the people behind the brands that we carry. More than just buying a product, we want the Withered Fig experience to be deeper in purpose and meaning. We want you to know the people behind the brands that have made this their living. It is the men and women, from the top to the bottom, the owners, the designers, the cutters and sewers, that encompass everything that each brand is. As such, we hope that the stories we share will not only help you learn a little more about what makes each brand unique but also encourages you to pursue your passions as well. 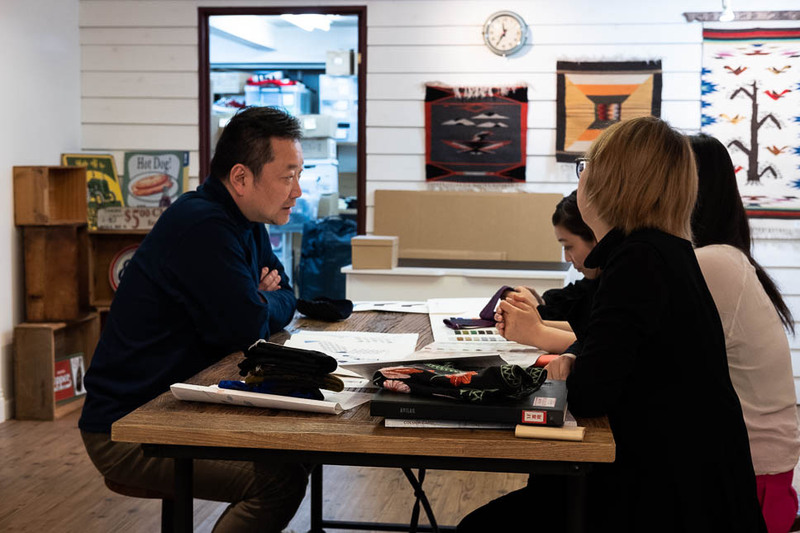 CHUP Socks is the brainchild of their director, Mr. Hashimoto. They have made their presence known in the boots and workwear community as you will often find a pair of Red Wings or Vibergs paired with a CHUP sock. CHUP consistently delivers unique patterns that pay homage to past and current folk and indigenous cultures. Using a low gauge stocking frame machine and the addition of hand-linked toes results in a laborious process that produces about 30 socks per day. 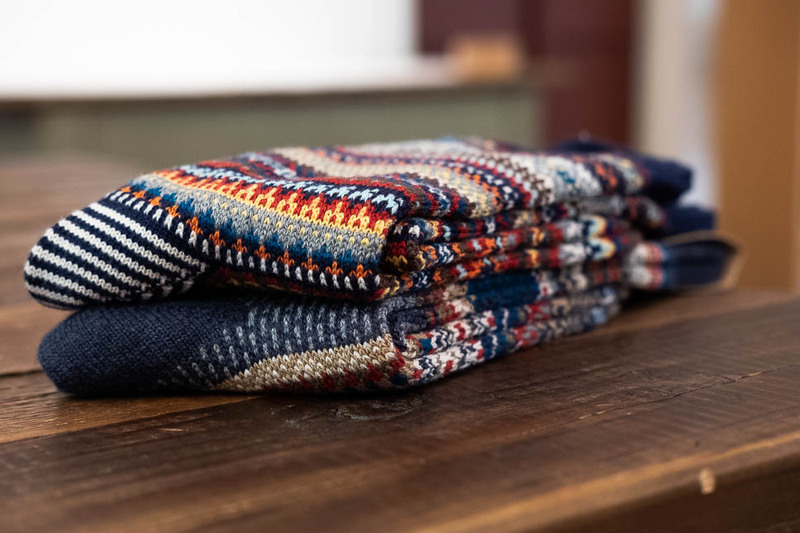 They have made huge strides within the last couple of years in the U.S., increasing it’s stockists as well as partnering with companies such as J.Crew and Smartwool. With the help of social media, they’ve also made their mark on the denim community, which we are certainly glad about. 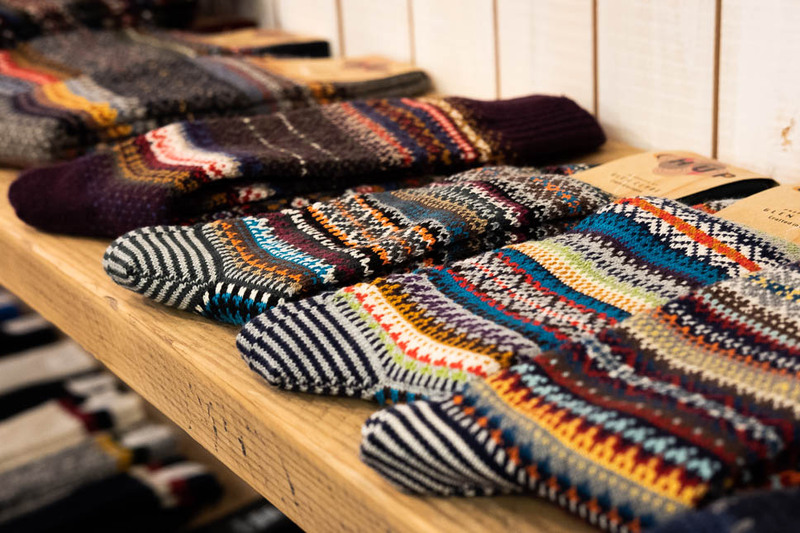 We sat down with Daniel Nishina [D], Sales Manager for CHUP Socks at their headquarters in Tokyo, Japan to gain a little greater understanding of the company and its origins, the time-intensive process of making socks, and their vision going forward. 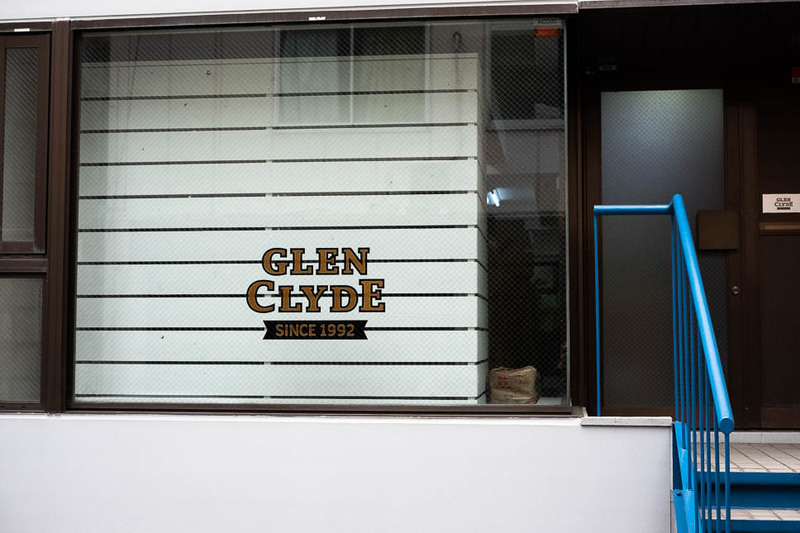 CHUP Socks is relatively well known in workwear community, but let’s start with Glen Clyde. 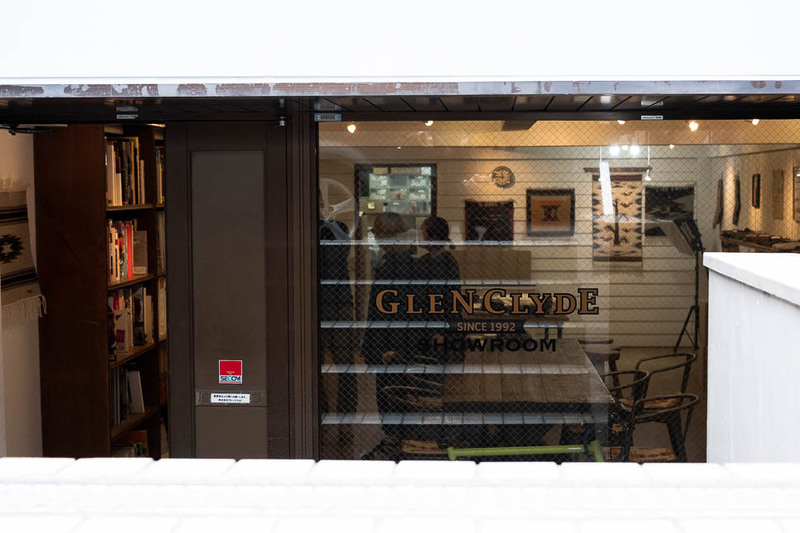 What is Glen Clyde, and how did CHUP come along? 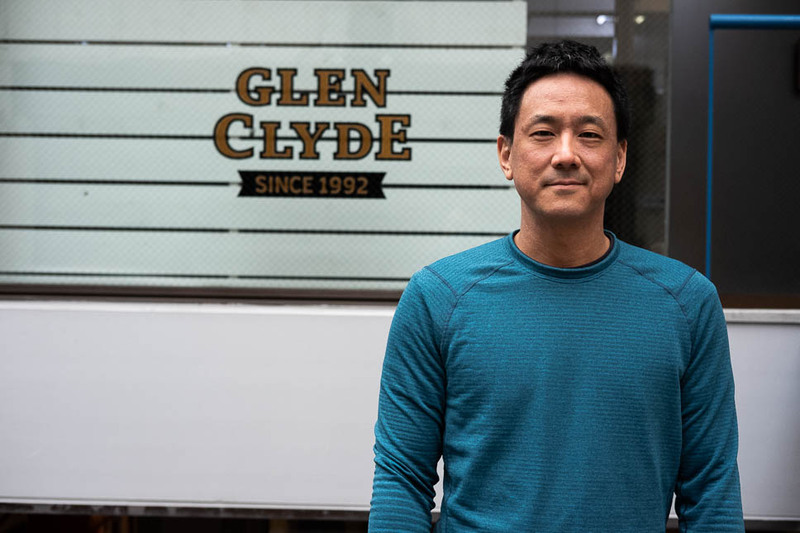 D: Glen Clyde is Mr. Hashimoto’s company, and he is our director. He worked in the fashion industry from when he was young – 18 or 19 years old – and for whatever reason became interested in socks. So when he decided to start his own company, he borrowed a desk in a factory and was able to be near all the technicians and craftsman who programmed and operated the machines. 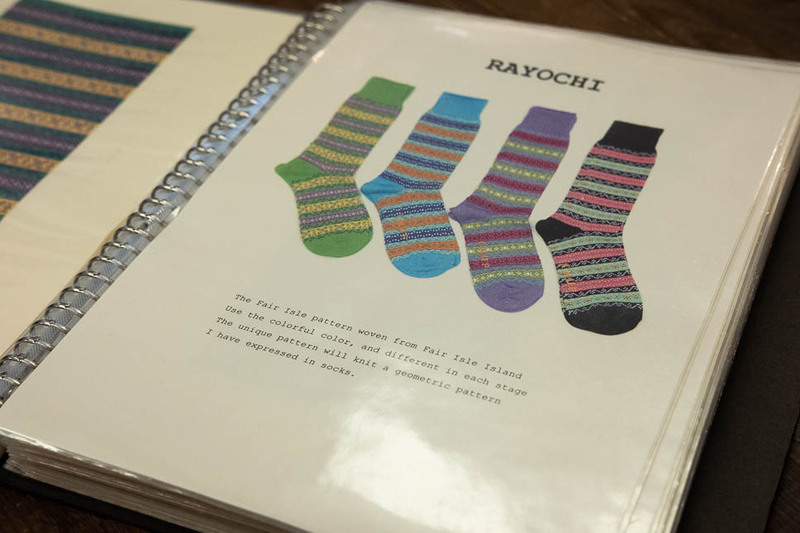 One big break for the company was when Mr. Hashimoto came up with the idea of ankle socks, which had never been done in Japan. That was a very big hit and a huge success. At the same time, it was a learning experience for him – as with any trend it died out and stopped, and he was left with nothing after that. However, he managed to keep it from dying. As far as CHUP Socks, the brand started around 2009 and it was only in Japan at first. There were some lucky breaks and eventually we got into the overseas market. Now, we’re practically trying to shut down the Japan market because 90% of our sales are overseas. There’s a limited production capacity, so it is just impossible to make more and more. As an example for the last season, we took our overseas orders first [before taking any Japan orders] and that pretty much brought us to maximum capacity. D: Mr. Hashimoto’s background was already in socks, and so it just happened to be what he could do. There wasn’t a deep or complex reason, but it continues to be his passion. He very proudly says he’s crazy about socks; he’s so fixated on them. He wants to be able to know everything and anything about socks – a socks otaku (geek). We’ve had occasional suggestions from people asking, why don’t you make hats or caps. But we just choose to make socks. 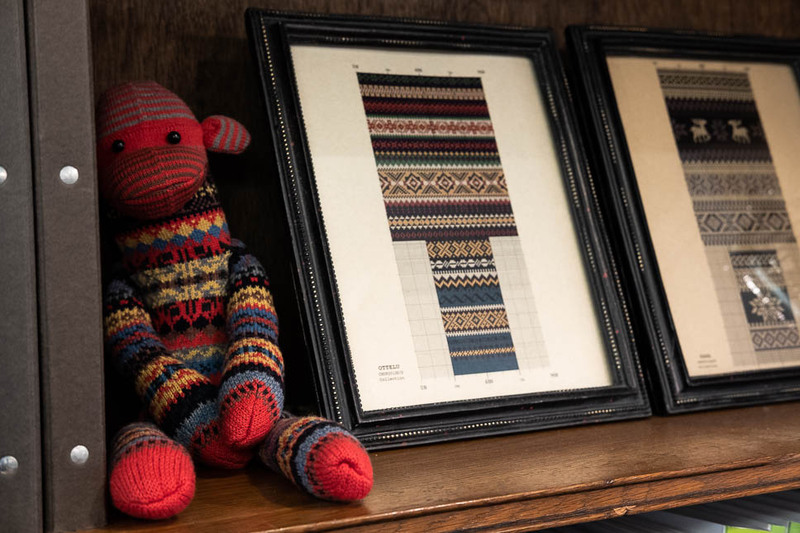 We see a lot of Fair Isle and Native American patterns. How are the patterns developed and what are the inspirations and significance behind them? D: Mr. Hashimoto’s idea was clothing, which is quite a basic need – to envelope and protect your body. So he was thinking of this primal aspect of apparel. He started to think about folk cultures, indigenous cultures, and old cultures; and that aspect leads to researching Native American cultures, Ainu culture, Guatemalan culture, even European. So that’s what lead to using those patterns. In the research, he developed a library of all these patterns of textiles and knits. Eventually, he gravitated towards the Fair Isle and Native American designs as those were his personal preference. Being based in Japan and Asia, how prevalent are Japanese or Asian culture designs in your socks? D: In the beginning there were a few Ainu ones – indigenous old Japanese people, still in existence but sort of marginalized and forgotten, unfortunately. We’ve also had patterns that were Thai inspired. How do you go about assembling a seasonal collection? Do you ever repeat similar patterns for subsequent seasons? D: Our collections are all around the original concept. They are related to these indigenous cultures, and the color schemes have some relation to nature. But, it’s not some separate theme for each new collection or within one collection. It has come up in conversation a few times, if one color didn’t sell well or one color sold out quickly, whether we should try to statistically figure out what’s more popular. But it’s been difficult as different people like different types of socks. There are a few patterns that were repeated one or two times early on. But what happened unexpectedly was that some CHUP fans would come up to us at trade shows and say, you guys already did this one. Mr. Hashimoto did not like that feeling – putting out something stale. Since then, we stopped repeating anything and so every single pattern is new. On production capacity, can you go into the details of how the socks are constructed and why there’s only a limited amount, how many people are actually making socks, etc.? D: CHUP socks are made on machines that are 35-40 years old with no replacement parts for them. So if they fall apart, that’s it – we lose production capacity. We also have the issue of people – the technicians who can manage those machines – are fewer and fewer. The slow speed at which CHUP are made is necessitated by the complex patterns as well as the age of the machines. The slowness also incidentally results in a different feel – the yarns get pulled into the machine more slowly and that results in a gentler feeling sock. CHUP socks feature hand linked toes. In making socks, the first step is to make it as a tube. Then, there are a few ways to join and close the toes. One method, the primitive way, is that you just sew it shut and turn it inside-out. The other way is to do it nicely with a Rosso seam. But when you close it with the Rosso seam, you will have extra fabric against your toe. This is fine, as most people are used to it and won’t notice it. But the hand-linked toe uses the real edge, so there’s no leftover lip of fabric that is hitting your toe, it’s very smooth. There’s this very particular machine that can do that. For dress socks, it’s not uncommon as it’s a thinner sock. However, CHUP socks are low gauge, thicker yarn, socks. Low gauge hand linking is not common. Mr. Hashimoto had to scour the whole country of Japan to find the machines that can do that – bring them out of trash, storage, and buy them. Then he had to find people who could use them, or even bring them out of retirement and pay them enough to make it worthwhile for them. So there are very few people that can do low gauge hand-linking toes. While it’s conceivable to have CHUP without hand-linked toes, it has been a feature of CHUP socks so far. In the CHUP video, you can see a steel tube – it’s basically a circular sewing machine. So when you have a pattern that repeats, the machine and needles can continue around in a circle. 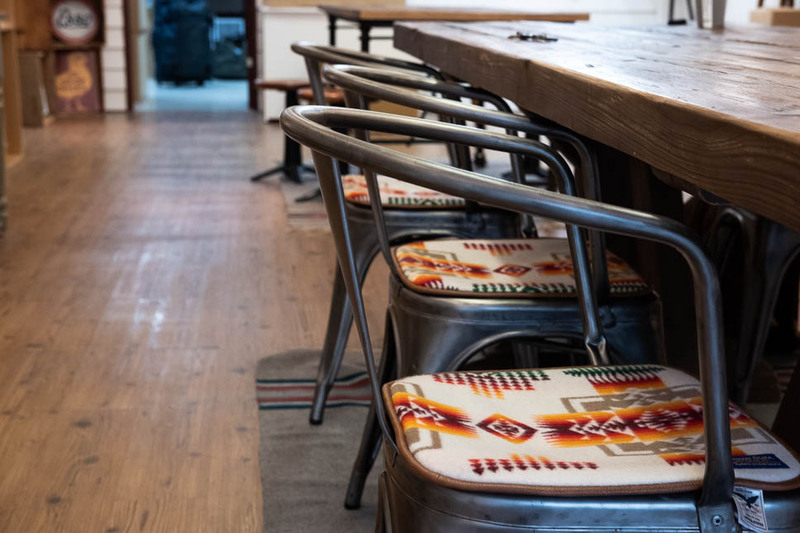 But, when a pattern is just one part / one section (like a lot of the Native American patterns), the machine has to go back-and-forth instead of around-and-around, which slows down the machine. So with the Native American patterns, we have to calculate how much slower the machine will work, which relates to how much our production capacity is. Are you ever limited in the type of designs that can be realistically constructed and produced? 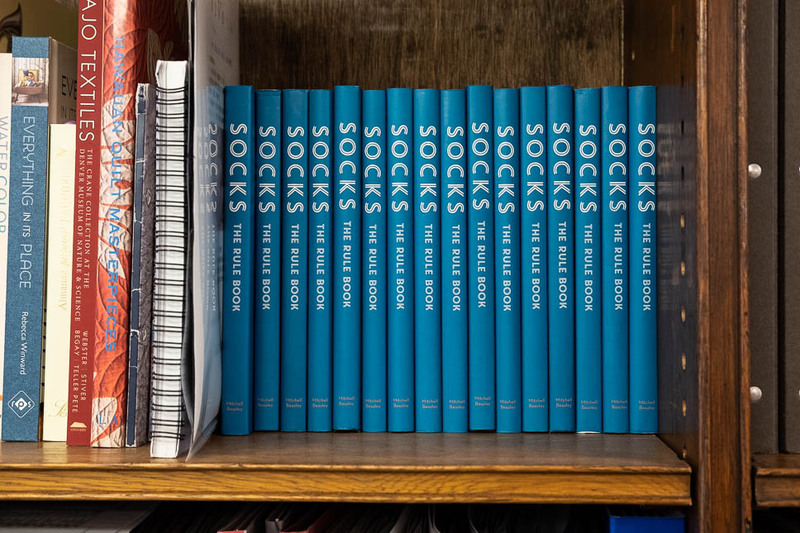 D: The sock is comprised of the yarn on the outside, and the yarn on the inside – also called back-yarn or inside-yarn, and that needs to be elastic. Sometimes the pattern is too dense, meaning the sideways/horizontal pattern is complex. And that section will be a little hard to put on, as the dense pattern basically acts like an elastic and keeps the sock from stretching. So we need to balance the sections that are easier to put on, with the sections that may be slightly harder to put on. For those who happen to turn your socks inside out, they might notice a seam where some of the threads hang loose, can you explain this? Whether or not you have cut or continuous yarns on the inside depends on the pattern. Also, there is inevitably a seam where the design begins and ends – that runs vertically up the sock and will have yarn ends visible on the inside of the sock. (If you see looseness or the beginnings of a hole along the seam, it’s not so much a defect as it is a side effect of the construction. Just turn the sock inside out and tug on the loose yarns. You could even tie the ends together). In any case, if we cut all the yarns to be short on the inside of the sock, then those loose ends would end up coming out to the outside of the sock. In the U.S. there is a pretty substantial following of CHUP with the workwear, denim, and boots community. Was that part of the vision, or did that come out organically? D: That definitely came about organically. Even the very first big breaks that we had as a brand were the workwear type shop/owner that wanted to carry it in their store. Unionmade was one of the first and was a very well known shop at that time. And now, with internet culture, Instagram and other social media, it keeps going in that direction. It’s good and bad. It’s nice in that we go to trade shows and we get to listen to customers and see how it’s going – we can see that the brand has taken root. At the same time, we ask ourselves how do we reach other people – maybe a different sentiment or aesthetic that reaches other people. Business-wise, only having CHUP for the workwear/heritage person isn’t too comfortable for us as well. There’s not much research we can do in investing in a whole collection and throwing new stuff out there to see if it works. We’re still a pretty small company, and we don’t have unlimited production capacity. But it is a conversation we are having. As you have expanded, how has that affected how you view the customers? D: We really think of what the customer wants when a new design comes out. When we dispatch, we handle all the distribution ourselves. Mr. Hashimoto actually gives a little touch to every sock before they go out. He does this to kind of say, “please find a good person who will wear you.” There’s that sentiment that we have and that we want to continue to convey. Mr. Hashimoto is still very much involved in the products from initial conception to the production and ultimately dispatch. How did you come to join CHUP? D: I was actually teaching English and the folks at Glen Clyde were coming for a time as students. Then while I was in the midst of some life transitions, Mr. Hashimoto called on me because their previous international person had quit, so it was good timing. My wife is in the fashion industry so it’s nice to have some professional connection with her now, too. How is it working in Japan versus in the U.S.? Any interesting cultural differences? D: It’s nice to work in a small company. I think it gives me a lot of autonomy. Basically, I’m in charge of anything international. Of course, the boss may come in at any time on an issue because the company is his baby and his responsibility. In general, Japan seems to have a lot of social rules at varying levels of people’s consciousness. I’ve been here long enough that I tune out and don’t get bothered by it. I would say one challenge that is gradually becoming more relevant to Japanese people is having awareness and knowledge that they are part of the world culturally and historically. Any people, actually, could benefit from a deeper grasp of what/how/why their own culture is the way it is and in the context of other world cultures. 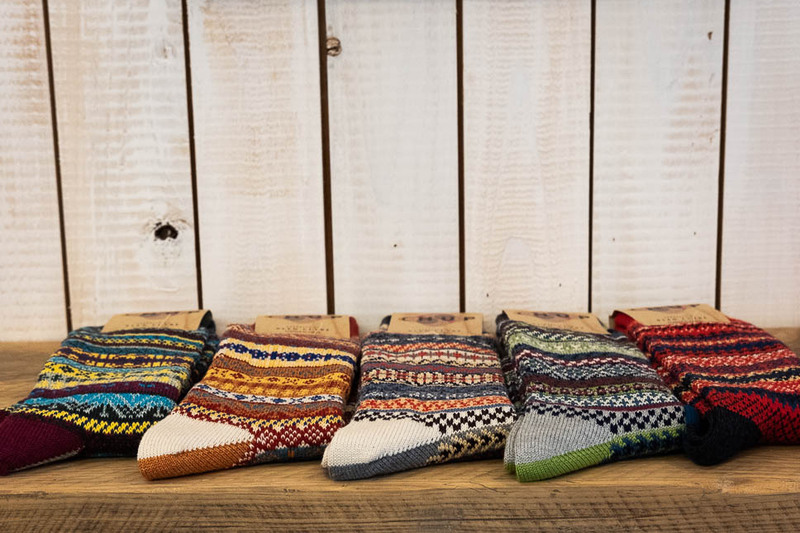 Do you also have the same interest in these socks as CHUP customers do, or do you try and keep some distance from personally owning too many of them? D: I’m also in charge of most of the private label (ODM) accounts so it’s good to know other sensibilities other than just CHUP. I don’t make any effort to have some maximum ratio of CHUP in my closet but I do try to keep my antennas tuned to everything that’s happening out there. You can find the latest CHUP socks over on the Withered Fig store starting November 26, 3:00 am. As a special promotion for the introduction of CHUP to Withered Fig, for 24-hours only, buy any three CHUP socks and get the fourth free. Discount is automatically applied at check-out starting November 26, 3:00 am through November 27, 3:00 am (all times EST). This offer cannot be combined with other promotional discount codes.